Low Maintenance Luxury Villa Living by Bridgewater Communities, your villa experts. 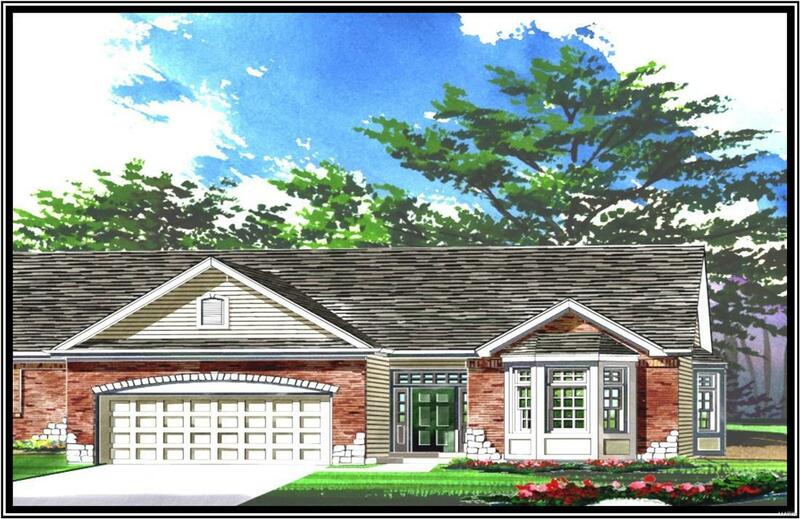 Not only will you be the first owner, this home has been built to paint stage allowing the buyers to make personal selections & finish choices! This popular Warson plan has 2 BD, 2 BA & 1,600 s/f of open, smart living space. The ext has a rich brick & stone elev, arch shingles, prof landscape, full yard sod, irrig system, low maint vinyl siding & a wr iron mailbox. Features inc an O/Sized 2 car garage w/opener, stately 9clngs w/vaults, large rectangular island, Whirlpool appl, W/I corner pantry, main flr laundry, 32 door openings, spacious Mstr Suite with W/I closet, 90 vanity in the Mstr Bath, transom window in the hall bath, R/I bath in the LL & a 12x12 low maint deck off of the Dining Area. A low monthly fee covers lawn, landscape & snow removal (per C&Rs). This intimate, all cul de sac community has easy access to Hwys 40-64 & 70, shopping, restaurants, health care, golf, rec & fitness cntrs.